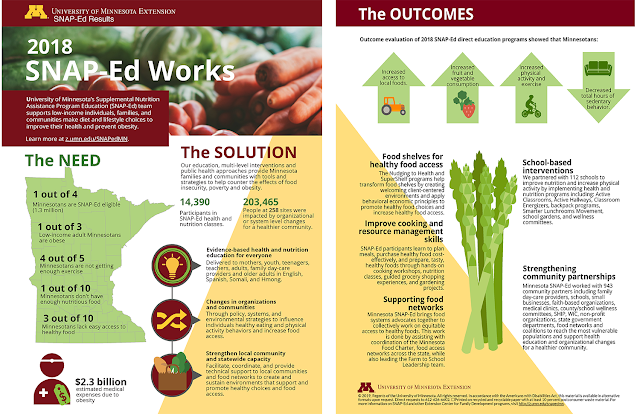 Each year we evaluate the impact of the great work of SNAP-Ed. Thanks to many of you SNAP-Ed reached over 203,000 Minnesotans in 2018. Take a look at the new infographic (PDF) and see how SNAP-Ed works! SNAP-Ed helps people lead healthier lives. SNAP-Ed educators teach low-income families and individuals about good nutrition and making their food dollars stretch further. SNAP-Ed educators also help participants learn how to be physically active.